The parties are one of the best moments in the history of a society, where an entire nation is unified for the celebration of the dates which constitute a special day, obeying a religious, patriotic or sentimental. During the date of the celebration, in addition to the customs, and the company of family, friends and all those visitors, it is possible to enjoy the delicacies typical of Russia and delicious. On the eve of a celebration, the color, the music, the gifts, and smiles, are clearly visible elements in each one of the faces, homes and streets of every city of Russia. These occasions generates the desire of being surrounded by the people who loves you and you love and toast for happiness and respect the traditions. 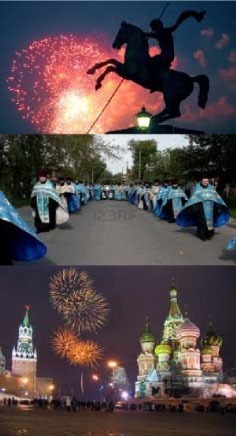 1 and 2 January: The New Year celebrations. Click here for more information. 7 January: Celebration of Orthodox Christmas. Click here to know more about. 13 January: "The Old" New Year party. Read here about. 25 January: Celebration of the day of St. Tatiana. Click here for more information about this celebration. 23 January: Celebration of the day of the defender of the fatherland. Click here to know more about. 14 February: Saint Valentine's Day party (worldwide celebration), click here to read about. 8 March: International women's Day celebration (a worldwide celebration), click here to read about. March: Celebration of Carnival (the Carnival), to	click here	read about. 1 April: Celebration of the day of the innocents, click here to read about. From April to May: Celebration of Orthodox Easter, click here to	read about. 1 May: Celebration of the feast of spring and labor. Read about click here. 7 November: Celebration of the day of reconciliation and concord, click here to read about. 22 June: the Festival of Ivan Kupala. Click here to	read about. 12 December: Celebration of the day of the Constitution of the Russian Federation, click here to	read about. 12 June: Celebration of the day of the Declaration of the national sovereignty of the Russian Federation. Click here to read about.